It's always great when you find a company that produces a quality product, backed up by good support. For a while know I've been looking for a replacement to the Cisco VPN Client that I use to connect my client's VPN. Cisco have produced a version of this software for Vista - but have stated categorically that they will not be supporting the 64 Bit version of Windows. Instead they are expecting their customers to throw away perfectly good equipment - in favour of their new ASA platform of firewalls and gateways - which in turn will use their new AnyConnect VPN software, which does of course support the 64 Bit Windows. Along comes NCP and their NCP Secure Entry Client in both x86 and x64 flavours. A 'very' configurable VPN client with a few extras too boot. The CISCO VPN Client doesn't give much away in terms of the detailed settings required to establish an IPSec connection. 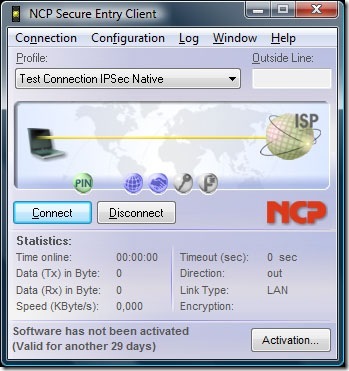 And IPSec network connections operate in different modes, and have several configuration settings. That said, after a quick email to NCP support, and very helpful reply, I am now connecting just fine to my client's Cisco PIX.